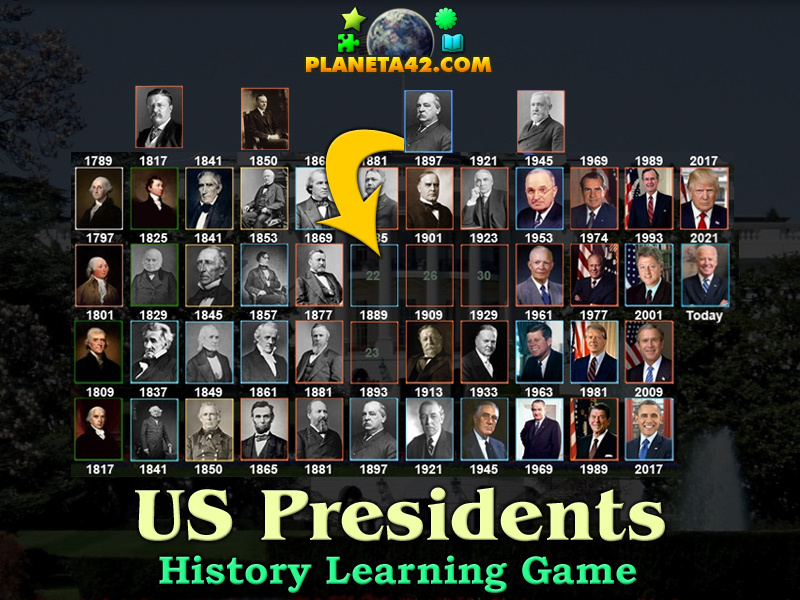 45 presidents of the United States in a fun online history learning game. "US Presidents Puzzle" is a free online knowledge level game, about the List of Presidents of the United States. It is a small puzzle game for desktop computers, laptops and tablets, which may be played in the web browser. Drag and drop the portraits of the presidents in their correct year of presidency. The History Knowledge Board include all 45 presidents till 2017 to play with. Part of the Interactive Civilization Monuments educational tools. When is the presidency of each president? Who is the latest president of America ? How many presidents do US have till 2017? The presidents of the US by presidency year? What is the party/agenda of each president of the US? Who are the presidents by number? Who is the president, which appear twice i number? How to play US Presidents Puzzle. 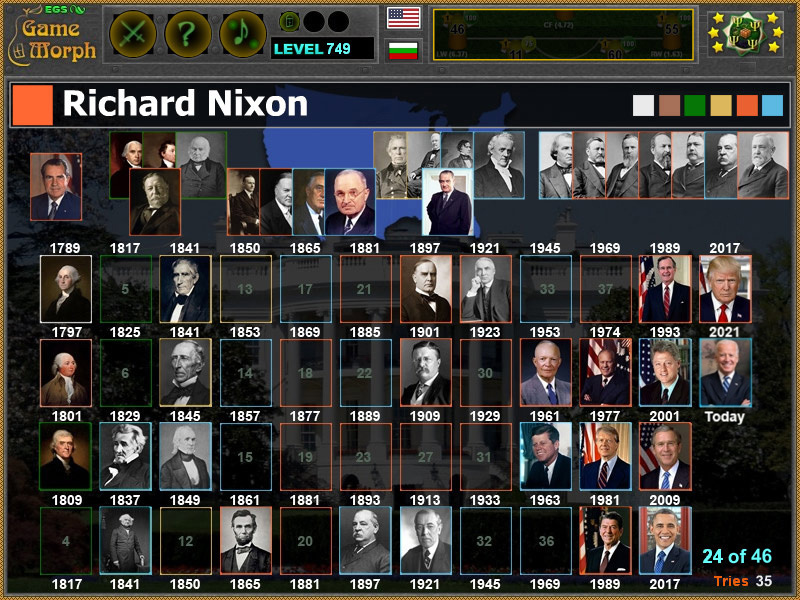 Here are all the 45 presidents, made like movable cards on the top of the screen. again indicating the party color and number of the president. Drag and drop the president portraits in the correct place. The numbers goes from the left column down, and the pictures are arranged in rows. The game is more like learning tool, rathar than testing tool, so it is not very hard to count the rows and columns and place all presidents in order. Know at least 5 presidents of America. Winning the game rewards +1 Knowledge Level from civilization category. Class subject: The USA presidents. As one of the oldest democracy, the United States of America have 45 presidents so far till 2017. Here they are by numerical order: 1. George Washington - Unaffiliated 2. John Adams - Federalist 3. Thomas Jefferson - Democratic/Republican 4. James Madison - Democratic/Republican 5. James Monroe - Democratic/Republican 6. John Adams - Democratic/Republican 7. Andrew Jackson - Democratic 8. Martin Van Buren - Democratic 9. William Harrison - Whig 10. John Tyler - Whig 11. James Polk - Democratic 12. Zachary Taylor - Whig 13. Millard Fillmore - Whig 14. Franklin Pierce - Democratic 15. James Buchanan - Democratic 16. Abraham Lincoln - Republican 17. Andrew Johnson - Democratic 18. Ulysses Grant - Republican 19. Rutherford Hayes - Republican 20. James Garfield - Republican 21. Chester Arthur - Republican 22. Grover Cleveland - Democratic 23. Benjamin Harrison - Republican 24. Grover Cleveland - Democratic 25. William McKinley - Republican 26. Theodore Roosevelt - Republican 27. William Howard Taft - Republican 28. Woodrow Wilson - Democratic 29. Warren Harding - Republican 30. Calvin Coolidge - Republican 31. Herbert Hoover - Republican 32. Franklin Roosevelt - Democratic 33. Harry Truman - Democratic 34. Dwight Eisenhower - Republican 35. John Kennedy - Democratic 36. Lyndon Johnson - Democratic 37. Richard Nixon - Republican 38. Gerald Ford - Republican 39. Jimmy Carter - Democratic 40. Ronald Reagan - Republican 41. George H. Bush - Republican 42. Bill Clinton - Democratic 43. George W. Bush - Republican 44. Barack Obama - Democratic 45. Donald Trump - Republican. And here are small portraits of them, framed with the party color of each president. Try to put them in their correct year of presidency. Portrait pictures and info from Wikipedia. Labels: Games with Persons , Puzzle Games , Flash Games , History Games , Education Games , Free Online Games.